When I was growing up, there was a game show on tv called “To Tell the Truth.” The various contestants tried to trick the game show panelists into thinking they were the true zoo veterinarian or whatever weird occupation was featured that day. Sometimes I think my colchicums are trying the same trick on me. Oh, I can tell they’re all colchicums, all right, but is each one the cultivar it’s supposed to be? 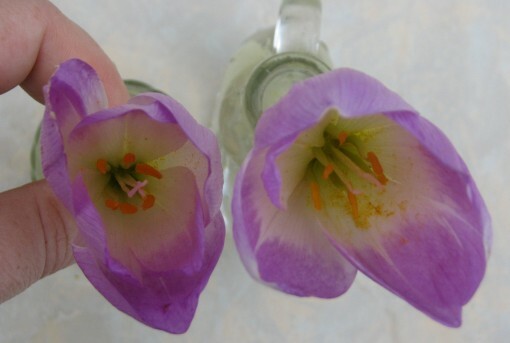 On the left, we have Colchicum ‘Autumn Herald.’ On the right, C. ‘Violet Queen.’ According to Odyssey Bulbs, ‘Autumn Herald’ has “wine-purple, ivory-eyed flowers, accented by pale-orange anthers.” And ‘Violet Queen’ should be “Rich, imperial purple with a white throat. Moderately tessellated” according to McClure and Zimmerman. If you are like me, you are wondering exactly what the difference is between wine purple and imperial purple. 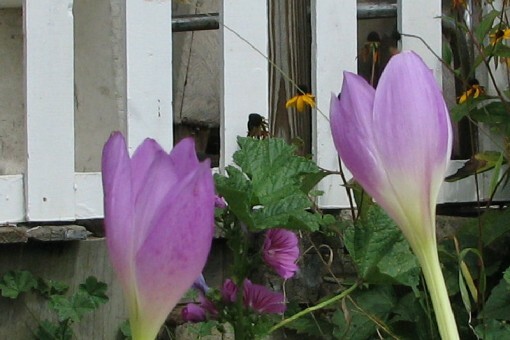 Compounding the problem is that fact that colchicums emerge from the ground quite pale, gradually deepening in color. I tried to pick a representative from each clump that was at its peak, but who knows? All the flowers in both clumps now seem deeper to me than when I took the photo 6 days ago. I don’t know whether cooler temperatures or just the passage of time is responsible, or whether they just look pale in the photo. Looking inside the flowers, you can see they both have orange anthers, but would you call that orange pale? And I would call the tessellation of the flower on the right, which is supposed to be ‘Violet Queen,’ faintly tessellated as opposed to moderately tessellated. You can’t see this, because I cropped it out of the photo, but the ‘Violet Queen’ on the right is a couple of inches taller. That could be because they are in different locations, so I hesitate to use it as one of my criterion. And to be really scientific, I would also have to compare their foliage in the spring. So, okay, maybe they are two different cultivars. But I would never dare plant them next to each other, because I’m not at all sure I could tell them apart. If these were the only two giving me trouble, I wouldn’t sweat it so much. But as much as I hate to admit it, many of my colchicum cultivars look an awful lot like each other. And I’ve certainly had impostors before. I’ve been paranoid about this ever since an email correspondent told me that a goodly percentage of colchicums sold are not what they are labelled, but merely variants of C. speciosum. (I’ve since lost his email address and all our correspondence to a backup snafu, so I hope he gets in touch again.) This is a discouraging state of affairs, especially given the price of single bulbs. It makes it difficult to whole-heartedly recommend them to other gardeners. Well, if you can’t tell the difference between wine purple and imperial purple, it probably won’t break your heart to get the wrong one, and 1) it will still look good, 2) it will still be just about rodent-proof, and 3) more than likely will multiply quickly, repaying your investment. You need to plan ahead if you want some, because they bloom in the fall, and even though they are treated as a fall bulb for planting purposes, they really need to bought and planted before autumn is well under way. However, if you happen to find some at your local garden center, even if they’re blooming, don’t hesitate to get some. Looking forward to seeing your colchicum photo, Jenn. And yes, I’m familiar with the website–my sticker is on the homepage, but you have to scroll pretty far down to see it. I have a blossom about to be full – I’m taking pictures!